I am sharing a card on the Sweet ‘n Sassy Stamps blog today and wanted to share it with you here as well. This card was designed using the new clear stamp set, Celebrate the Savior designed by Krista Hamrick for Sweet ‘n Sassy Stamps Creative Worship line. 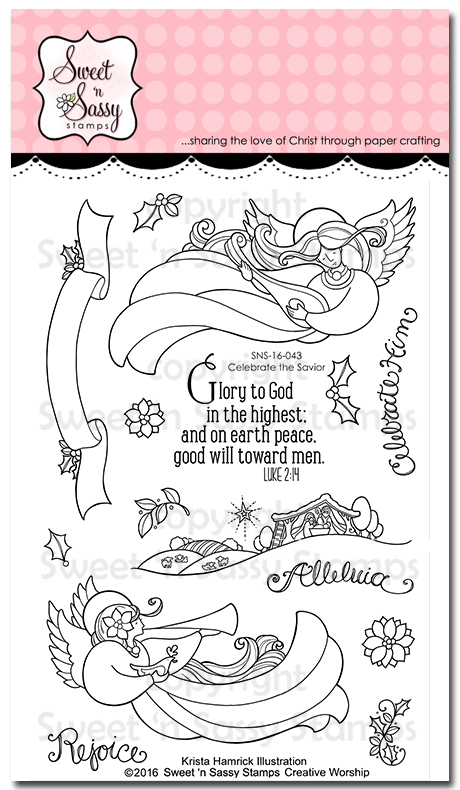 I love the images in the Celebrate the Savior clear stamp set- perfect for Christmas cards as well as Bible Art Journaling! I am also linking this card to the Stampin’ Celebration SC134 Photo Inspiration challenge (I was inspired by the grays, cream and elegance of the items in the photos) along with the Simon Says Wednesday "Anything Goes" Challenge and the Paper Players PP311 Theme Challenge. Slightly distress the edges of a piece of designer paper and use a sewing machine with a zig zag stitch to adhere the paper to a piece of gray cardstock. Distress the edges of the gray cardstock and mount onto a piece of vanilla cardstock. Add the crochet lace and gray ribbon (wrapping the ribbon ends behind the card front_ and mount the entire card front onto the gray card base. De-static a piece of vanilla cardstock, ink the sentiment and angel image with embossing ink and heat emboss with gold embossing powder. 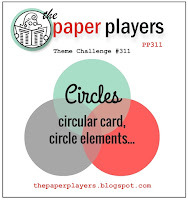 Die cut the embossed images with a large circle die and also cut a piece of gray cardstock with the same size die. Split the gray circle die cut in half, adhere behind the embossed image and distress the edges a bit. Mount the focal image with dimensional foam, add the triple satin ribbon bow and adhere pearls to finish off the card. Thanks for stopping by- hugs and I hope you have a wonderful week! SUPERB!! Love your attentions to details! Thanks so much for playing Simon Says Stamp Wednesday “Anything Goes” Challenge! Beautiful colors and design. Well done! Gorgeous, Julie! I just love the neutral colors and that bow is amazing! Thanks for sharing this with us at the Players this week! Beautiful card, Julie! It is very elegant with lots of fabulous details. 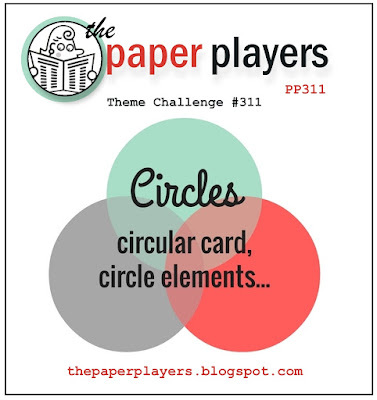 I love how you incorporated the colours from our Inspiration Challenge. 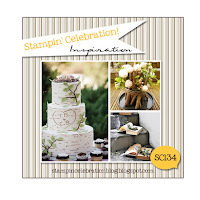 Thank you for joining us this week at Stampin' Celebration Challenge. A beautiful circular focal point Julie! This is beautiful! Thank you so much for joining us at The Paper Players! What a beautiful card! I love the gold angel and that bow is just perfect! Gorgeous designer paper and I am loving that jumbo lacy scallop!! 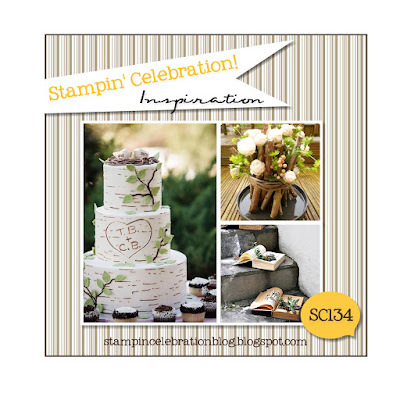 Thanks for playing along with us at Stampin Celebration...you rocked this inspiration challenge! !